Needless to say, maple sugaring is on my mind these days here in early spring. Everywhere we go the questions to us gush out like sap on a good day: “Will it be a good season? Will this weird winter affect sugarin’? Made any syrup yet?”. And the answers are, respectively, “Huh?, huh? and No!”…translation…no one can answer the first two questions. A good sugar season is only made by springtime “sugar weather” and winter is a whole different season, not really related to sugarin’ , and thus no predictor of maple success. The final question is answerable…No, we have not made any syrup even though we had some fluky “sugar weather” back in January. By now, no doubt, you’re saying the only thing that I’ve “gushed out” is confusion. Congratulations. You’re now fluent in the language of “sugarin’!”. In sugarin’, we use words like “ornery, rocks and hard places” but leave out words like “certain and positive”. Speaking of rocks, we recently received an email question from a man who had just purchased some land with “big and beautiful” maple trees on it. His question to us was about ledges: “There’s quite a bit of ledge on the property, which I’m curious how that affects the quality of these trees”, he asked. My answer of choice would have been “…huh?”, but not wanting to be rude, I responded that ledges can cause trees to be shallow-rooted and weak. Since he had described his trees as “big and beautiful”, however, this point was a bit moot. I ended up telling him that I really had no answers for him and welcomed him to the world of “maple” where having no answer is the answer. 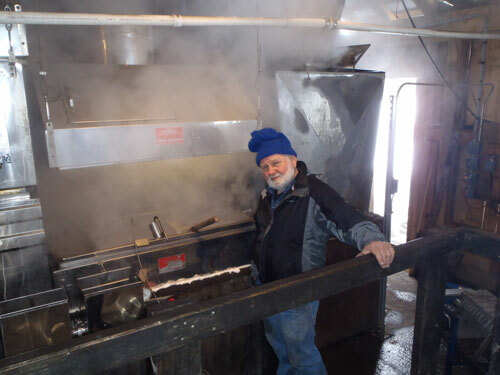 With eight generations of sugarmaking behind us, we basically plan on nothing but we have grown to count on a small handful of “givens”, like how sap will only run in thawing temperatures. Well, you can cancel that one! This past summer, I travelled to the sugarmaking area of Ontario and found a maple microcosm consisting of just one farm. On Peter and Karen Hamilton’s place in Branchton, Ontario, sap commonly runs in freezing temperatures. Again, speaking of “rocks”, the Hamilton’s whole farm, including their 3000 tree sugarbush, has only a few inches of top soil. The group I was with toured the Hamilton property. Huge Black Maples towered over us and we were told the behemoths were only rooted in one to three inches of soil. My first instinct was to run for the hills in case a stiff breeze came up but when I asked the question of tree weakness, our guide said never worry. “The tree roots find their way into fissures in the bedrock. Those rascals’re anchored very strongly, aye.” he said in a syrup sweet Ontario brogue. That bed rock not only serves as an anchor but an “oven” as well…sun heats up the bedrock and sends warmth up the trees. And that’s how a single maple farm in Branchton, Ontario denies all maple sugarmakers one of our erstwhile givens. And so, dear folks, all I can tell you for sure is that the sun will come up tomorrow morning…or will it? Being a maple sugarmaker has taught me to be guarded about such things but we better get out and finish tapping our 5000 trees just in case it does.